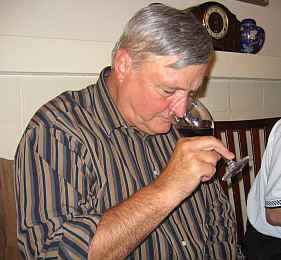 We surveyed a wide range of Zinfandels in our July 2007 tasting with the Vino Fino Tasters. The line-up included wines from the Carmel Valley and Amador, along with wines from Sonoma and Napa. 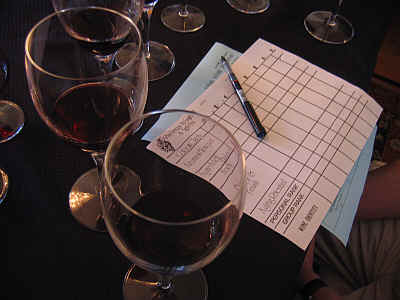 Further, there was a wide range in pricing, too, with wines from $15 up to $40 per bottle. The wines are "currently available" releases featuring the 2004 and 2005 vintages. The growing seasons of each is different, with 2004 being a warmer season and earlier harvest. The 2005 growing season was delayed by winter weather and rains in March. July of 2005 was a bit hot, but apart from that, the growing season saw mild temperatures and a later start to the harvest. 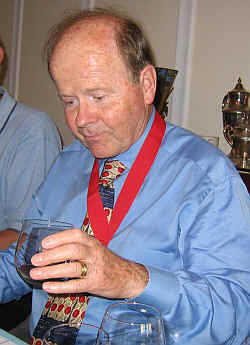 Two wines were virtually tied for the top spot, with one wine well behind the pack. 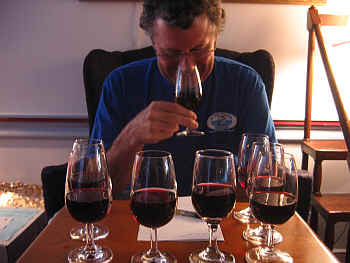 Six of the eight wines had at least one first place vote. Only 3 wines had last place votes. Though it was clearly the last place wine on all but one taster's scorecard, the wine is certainly a nice expression of Amador "old vine" Zinfandel. It's really ripe and moderately jammy with some woodsy notes. I pegged it as probably the Amador wine based on the nose. The wine is rustic and jammy with a tarry note reminiscent of some mature Italian red wines. I'd give it about a one-half star rating on my three star scale. 7th Place: ALEXANDER VALLEY VINEYARDS 2005 Alexander Valley "Sin Zin"
This wine was a shade lighter in color than many of the wines in this flight. There's a point of ripeness to the fruit on the nose here, with berry and smoke tones. As it warmed in the glass, I encountered a light peppery element with nice berryish fruit. Dry. Medium+ bodied. Good wine. Drinkable now and it ought to last for a couple of years. One star. I loved the aromas of this spicy, peppery Zinfandel. It's from a relatively unheralded appellation (nobody thinks of Monterey County as a Zinfandel area), but the vineyard was planted with great care and attention to detail. The winemaker at Joullian is a supreme wine "geek" and he's driven to create perfection. The spice theme runs through the flavors of this wine, delivering on the promise I found in the nose. Spice, berries and a good structure with mild tannins. Nice work. Drink now-2012+. One and a half stars+. This old-time winery has routinely been under the radar of most critics and their wines are usually attractively-priced. Zinfandel and Petite Sirah are the main wines of Foppiano and the past decade they've been reasonably consistent. I liked the aromas here quite a bit. Nice berry fruit with some vanillin and brown spice tones. This brown spice character, reminiscent of nutmeg and a hint of cinnamon and cloves, has been the 'signature' of Foppiano's red wines of late. The flavors offer the sweet spice character with good berry fruit. Fairly smooth on the palate. I gave this a one-and-a-half star rating. 4th Place: RIDGE VINEYARDS 2005 Dry Creek Valley "Lytton Springs"
Ridge continues to produce elegant Zinfandels in an era when many vintners seek to really push the envelope and make huge, late-picked wines. This wine is quite good and one can see it's a bit shy and reserved presently. I suspect this will start to blossom in 6 months or a year and continue to show well for a number of years. There's a blackberry tone to the nose and the same character shows up on the palate. It's dry and mildly tannic. Probably at its best from 2008 to 2012, or so. In the context of a blind-tasting, it's quite well-behaved but not the most flashy wine of the group. I'd bet on it and the Joullian (listed above) as having the best cellaring potential, though. One star presently. We really loved the 2002 vintage of this vineyard's wine from Rosenblum and have not found a succeeding vintage to be nearly as good. The 2003 and 2004 were a mess and while this wine is better than its two predecessors, it falls short of this vineyard's grand potential in our view. The fruit is really ripe and shows nice intense berry notes, but it's really simple and a one-note-samba sort of fragrance. I found the wine to be off dry and this was a bothersome feature. The wine has a fairly tannic streak to it, but with its 'flat' character, I'd not suggest cellaring this. I'd give it a one star rating but wish Rosenblum would pay more attention to capturing the full potential of this vineyard. Drink now or next year, by the way. The main theme to this wine is "big." It's deep and dark in color. The aromas are nicely fruity with bright berry tones and light oak. After a while I detected a hint of anise here, too. It's dry and medium-full bodied. One the palate the wine is a bit tannic and coarse, with bright berry fruit and ripe elements. It's nice now and should remain showy for a couple of years. One star to one-and-a-half stars. 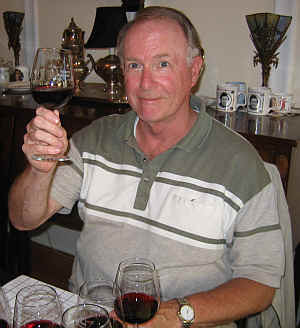 Steele's Pacini Vineyard Zinfandel has won two Vino Fino tastings, as the 2004 vintage also fared well with our group. Only two of the 11 tasters ranked it as their top choice (I was one), yet it was rather universally liked. The wine has a medium ruby color and lots of nice berry fruit. Plenty of oak (perhaps too much for some tasters), there's a minty aspect to the wine which I liked. 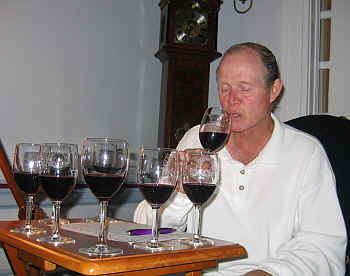 The wine is dry and medium-full on the palate. It's mildly tannic and shows big, ripe fruit notes in the mouth. Woodsy, too. I think the 2004 might have been the superior vintage of this, but the 2005 is quite good and worth buying. It may not have the cellaring potential of the 2004, but for immediate drinking with food, this is a lovely wine. Two stars.